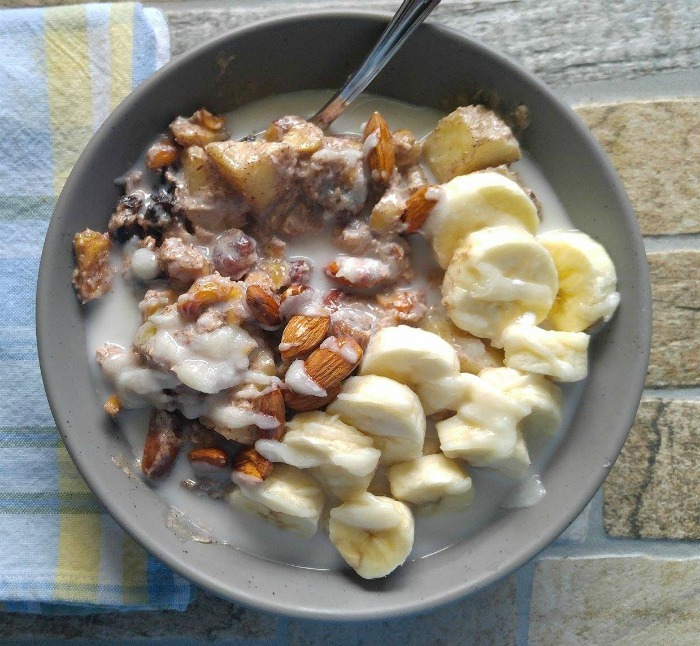 This healthy Breakfast Bowl is a rich and filling mixture of dried fruit, apples, raw nuts, coconut and other good for you ingredients. It makes a great alternative when you are tired of the eggs if you have been following a whole foods eating plan like Paleo or other high protein plans. A real plus is that this recipe is one of my 30 minute meals, ready in FAR less than 30 minutes too! Are you trying to follow a whole foods or high protein diet but seem to get “egged out” for breakfast? I love eggs as much as the next person but sometimes I just want a warm bowl of something without eggs. Can you relate? 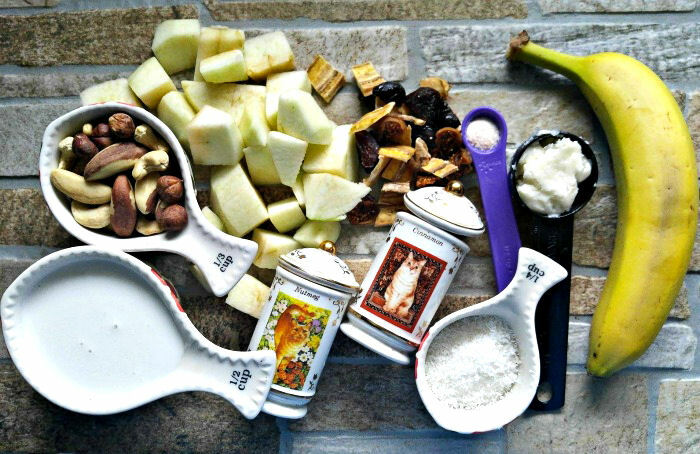 Since all forms of added sugar are a “no no” on an eating plan designed to reduce inflammation, dried fruit and the natural sweetness of apples and bananas add some sweetness. The protein comes in the form of raw nuts (I used filberts, hazel nuts and cashews in my breakfast bowl.) And coconut milk gives the bowl a nice creamy consistency. Many high protein and whole foods breakfasts normally feature eggs, so it’s nice to try one that does not, for a change, especially if you have been eating eggs for breakfast day after day. 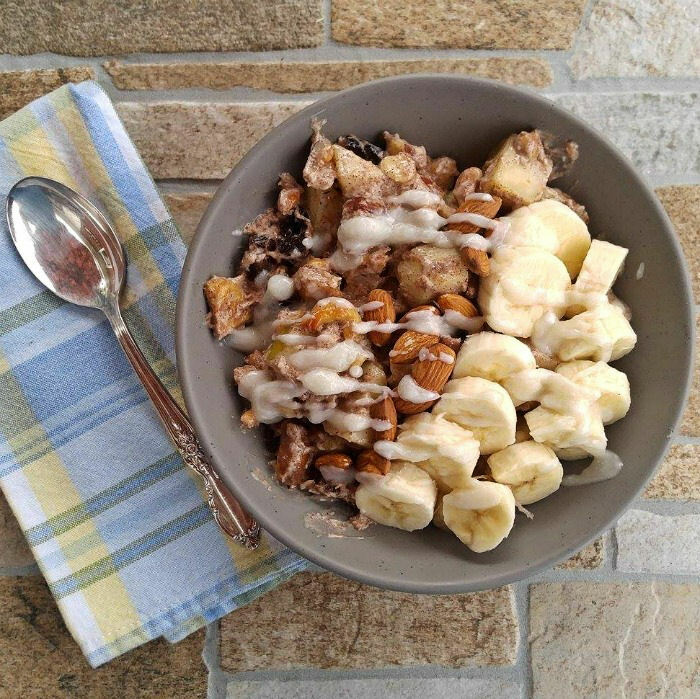 Making this Healthy Breakfast Bowl only takes about 15 minutes! 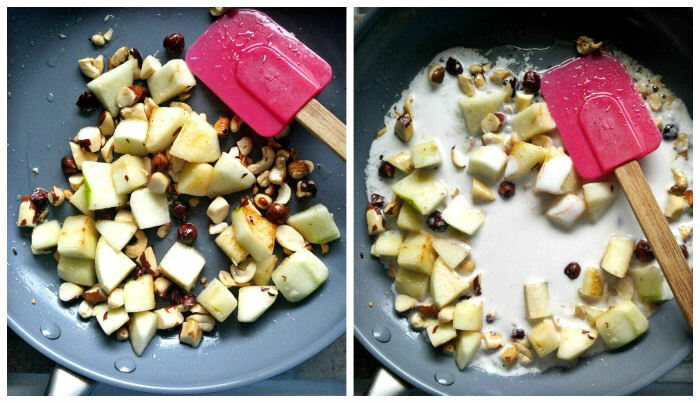 Start by heating some coconut oil in a non stick frying pan and cooking the apples and nuts, until the apples are tender and the nuts are just starting to brown. Add some coconut milk and cook for a minute or so. 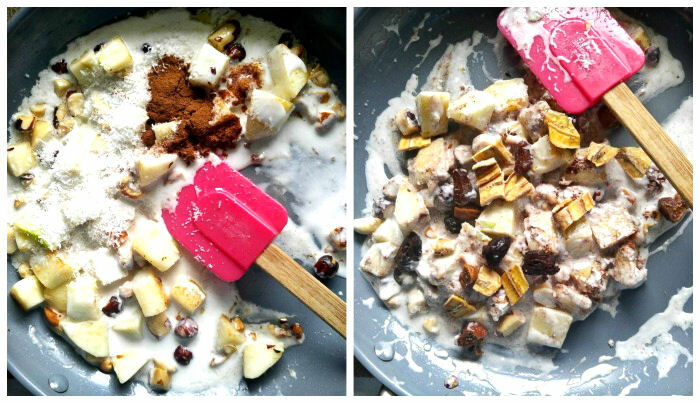 If you want a creamier porridge style mixture, add in a bit of unsweetened coconut milk. 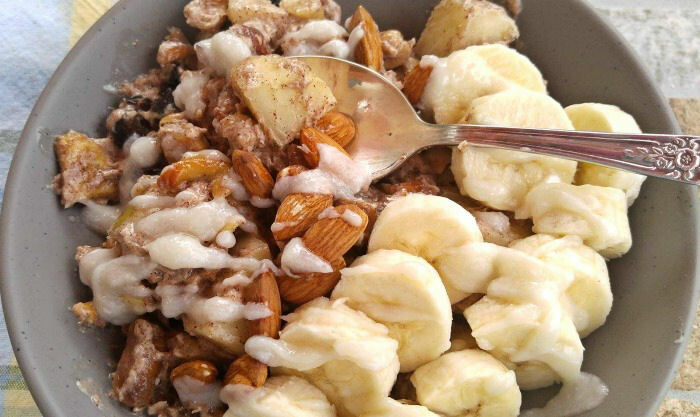 This Paleo breakfast bowl has the sweetness of the dried fruit, crunch from the nuts and creaminess from the coconut milk. It is hearty and filling and tastes great. Best of all, it’s a nice change from eggs for breakfast every day. One bite and you’ll be hooked. And getting it on the table in 15 minutes? Who can complain about that? This recipe serves 2 and works out to about 483 calories for each serving. It fits a Food Freedom plan, is Paleo, clean eating and gluten free. Although it is made with all Whole30 ingredients, it is still a rather sweet breakfast which can be a problem for those who are trying to not eat sweet items. All of these ingredients are Whole30 compliant. However, the plan has a specific requirement for the template of a meal for protein, vegetables, etc. It requires 1/2-3/4 veggies, protein and a plated fat. I have done the Whole30 plan twice and found that eliminating foods that tend to make inflammation a problem in the body was a real help for my arthritis. However, since this breakfast is sweet, when I ate this bowl for breakfast, I make sure not to eat fruit for the rest of the day and I used it sparingly during the month. The extra sweetness would seem to disqualify it from being totally Whole30 compliant if you are trying to follow this plan exactly as written. This healthy breakfast bowl comes together in just minutes and fits into a Vegan, Paleo and Gluten Free Diet plan. Heat the coconut oil in a non stick pan and cook the apples and nuts for a minute or so until the apples soften and the nuts start to brown. Stir in the coconut milk and mix well. Add the shredded coconut and spices and stir in the dried fruit. Cover and cook for about 3 minutes until the mixture is thick and creamy and some of the coconut milk is reduced. 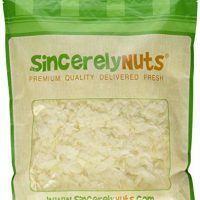 Don't cook too long, since you want the nuts to still have a bit of crunch. 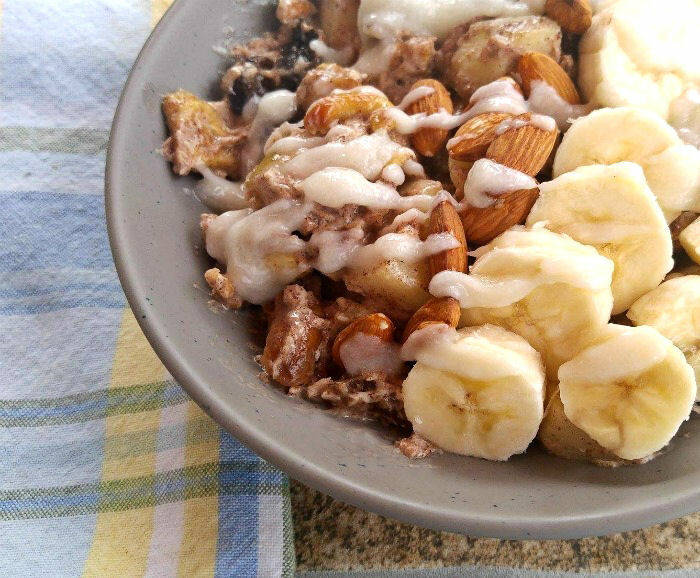 Top with sliced bananas, a few almonds and some melted coconut butter. 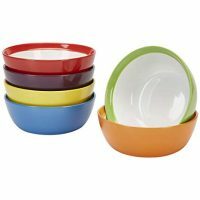 This breakfast bowl uses strictly Whole30 compliant ingredients. However there is more to the plan than just the ingredients. They like to keep the fruit to just 2 servings a day and not have recipes feed the "sugar dragon." The extra sweetness would seem to disqualify it from being totally Whole30 compliant if you are trying to follow this plan exactly as written but I will leave it to you to decide whether your will call it Whole30 or not. Are we to have the plate portions every day or is this breakfast ok and we don’t need the veggies? This is yummy! I make it regularly. I normally have enough for breakfast the next day which is great. I add a heaped tablespoon of ground Flaxseed and shelled hemp. Thanks for the recipe. Could I make a batch of this and just heat it up during the week? I know you said it doesn’t take a lot of time to make but the last thing I need in the mornings when I’m trying to get my kid ready for work is to cook myself breakfast. What is the protein level for this? Is the coconut milk the canned kind? Or the bottles kind in the refrigerated section like almond milk? Soooo yummy! Modifications: didn’t peel the apples or get coconut butter. I ate half and saved the other half in the fridge. I warmed up the leftovers the next day in the microwave and it was delicious! This was really easy to make and yummy. I didn’t have dried fruit or coconut butter but it was still very good! Will definitely make again! I made this and added 1 Tbsp of chia seeds to the nut mixture.